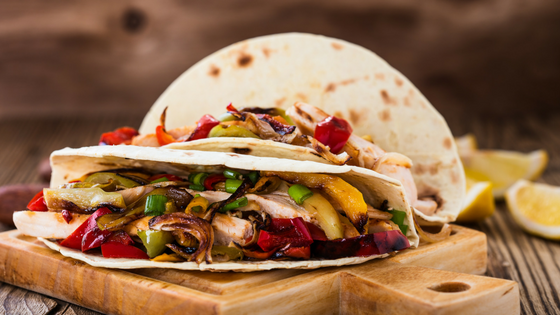 Contagiously Positive » It’s Fajita Time! The great thing about wraps is that you can add any of favorite veggies into them. If you want to add chicken, add chicken. If you want to add black beans for an extra protein boost, throw it in! Recipes are just guidelines. Have some fun and make up your own Contagiously Positive recipe creation. In a medium bowl, combine all the dressing ingredients. Refrigerate until ready to use. Pour olive oil into a large skillet over medium-high heat. Add red peppers, mushrooms, garlic, and onion, and cook for approximately 5 minutes. Add the tomatoes, and spinach cooking until spinach begins to wilt. Remove from heat. Divide vegetable mixture on each tortilla and top with 2 -3 tablespoons of dressing. Fold in half, grill it up or simple roll it up.